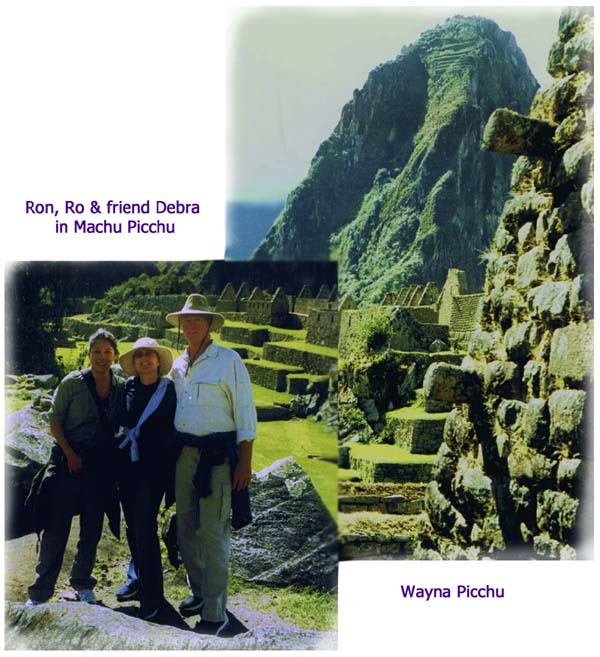 The following story is an exerpt from "Mystically Mundane" written by my wife Ro during our trip to Peru in 200? with our friend Alan Leon. For more stories read Lake Titicaca. We arrive in Aguas Calientes in the late afternoon. After getting situated in our modest accommodations, we walk up the steps to dinner, then up more steps of this most peculiar town to the hot springs. The slopes rise, seemingly vertically, and mind-blowingly high. Aguas Calientes is set on a shelf of sorts. We walk along a fast running little tributary which tumbles through town to join the Urubamba River. The town is wedged into what land there is. The main avenue in town quickly becomes a stair case climbing passed restaurants, inns, and vendors on its way to the town's name sake Aguas Calientes: “hot waters”. We are definitely foreigners here. We see very few US citizens on the whole trip (It’s 1993 and there are major travel advisories in place). The hot springs are a meeting place. The town comes here to bathe, they wash and shampoo in the showers, then soak and socialize in the healing natural pools. Tonight they are witness to a curious show of sorts. In the top pool are the towns people, lined up on the wall watching the people in the pool below. We are clueless but the top pool local people didn't seem exited to see us so we enter the low pool. There are a couple of dozen people working in pairs, one supporting another, floating. People float, cry, nurture. No one is speaking English, but from the fascinated faces of the upper pool they are something different and distrusted. They seem friendly and truly present so it seems we’ve chosen the right pool. Eileen is a friend from Sedona who is traveling with us and who can’t go anywhere without seeing someone she knows. Seriously, she once couldn't get a hold of a friend she wanted to surprise with a visit in Deli India so she took a train to the closest beach, while walking on the beach her friend, who was riding on a bus with no thought in his mind of Sedona spotted Eileen and had to stop the but just to be sure he hadn’t lost his mind and was hallucinating. So she looks around in the dark at the strange goings on and spots Carlos, an Argentine Shaman who lives is Sedona and is a member of her health club. He is a friend of Alan’s (our tour organizer) as well. This is Carlo's group in the pool, they are doing a re birthing process. Carlos had made the journey with his group in honor of a significant Mayan Calendar Event. It seemed that the following day was to be the opening day of the last month of cleansing and purification on the Mayan calendar. It sounded a bit Catholic to me but we were invited to participate with this group in ceremony at the Temple of the Sun. This turns out to be quite the coup as the Temple of the Sun is a pivotal spot on Machu Picchu, a central crossroad and troops of people are always wandering through on tour. 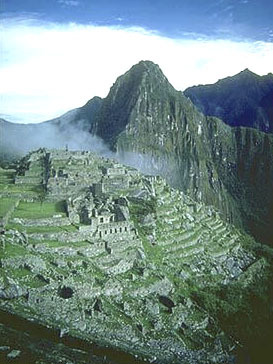 Energetically it’s a highlight of Machu Picchu but almost always littered with tourists. By joining up with the Carlos’s group we are able to commander the area and enjoy it in meditation. In the morning we take the first bus up the mountain. Machu Picchu is the closest thing to perfect beauty I have ever seen. As we step out into the first real view of the place, Ron and I sit. It brings Ron to tears. The place is so familiar to him. A flood of memories crowd his view. Ron’s house, the ceremonies, politics, his joy, and passions amid his disillusionment and pain all greet us at the gateway. We sat down on a bench just inside the doorway. Eileen and Gideon were quickly absorbed in exploration we just hang and let the memories come to us. Ron remembers in amazing detail. When we do finally move into the city, I let Ron lead. He moves slowly and methodically from place to place. Machu Picchu for Ron is bitter sweet. When we join the group at the Temple of the Sun that afternoon Ron takes the place he remembers from the past. Eileen and Gideon have rejoined us we stand holing hands in a circle, and with Carlos’s students, we are enough to commandeer the whole area forcing the tourists to take alternate route or postpone their viewing. The Temple of the Sun is a big rock carved into seats or alter spaces outside on a mound in the center of the city. Carlos the Shaman does a grandiose, self indulgent show, walking right to the center and standing on the sacred rock, where he delivers a dorkie sermon-like introduction to a meditation. Regardless or the entry point, the “where ever two or more are gathered” factor kicked in once the meditation was underway. A doorway opens and for Ron time alters and pictures from the past flicker in the sunshine of the present. The next day we hike to the top of Wayna Picchu. Wayna Picchu is a peak rising off the point at Machu Picchu. There was a fire on the point and it was closed for a time but that happened after our trip. It’s a killer hike, we were still at some altitude this hike is almost strait up and in some instances includes having to use wooden ladders or a rope to pull oneself up. The view at the top is beyond awesome. A river about a thousand vertical feet below wraps around the base of the mountain like a hungry anaconda. Gideon’s up here with us, he’s been touring most of Machu Picchu on his own preferring the company of the llamas. We do a nice meditation, no amazing insights but a truly wonderful energetic. The trip up was oxygen deprived and so dogged, but down is worse in parts. When facing the rock wall it’s just about the next vertical foot down has the added element of looking over the top of rickety wooden ladders dropping over the edge into pure space. About half way down there are sweet little ruins and gardens on the side of this vertical world so we check them out. “That must be why I’ve always loved watching you work.” he replies. After lunch Alan’s friend, Cucho gives us a guided tour though Machu Picchu. This man is apprentice to an Inca Priest here on the mountain. 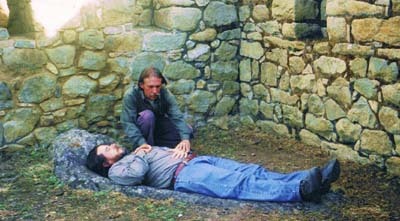 He recently did a five day vision quest in this sacred place and in the caves beneath Machu Picchu. I’d overheard other guides lecturing, and they all annoy me. Some of it was interesting but at the top of Machu Picchu over looking the city is a hut with a large flat stone in a beautiful empty field. The field would have been under cultivation back in the day. Earlier in the day I heard a guide tell his group that this was the morticians hut and that the stone was used to prepare bodies for burial. The large flat rock slopes away from the city towards the fields. On a moon lit night this place would be very romantic, but obviously not if there were corpses stacked up and the stench of rotting parts. Such a place should never be wasted on the dead. Unlike the guide's story, my body says that this is a place for lovers, conception and fertility rights for the land. I trust my body. I can’t help but begin to fantasize how sweet it would be to slip back up here tonight with Ron. To bad the hike up the mountain from the town below would kill me, then it really would be the morticians Rock. Our initiate-guide states only the things he’d seen on his journey. He wastes no time with textbook guide talk. He speaks of the sacred geometry of the city and of the land and the city. There is a peak across from Machu Picchu that frames the many of the windows in the city like fine art. At some point Ron and I each began to have our own relationship with the peak and a crystalline city within. The guide wastes no time, telling us about the crystal city that exists in the mountain peak Then he says my rock is for fertility and procreation. It’s not often that anyone confirms what we are seeing, he has my attention. Having a guide share his personal vision and teachings is a real treat. Not to mention I’d like anyone who’d agree with my version of reality. He is a wonderful guide and magnificent being, the problem being that none of us can maintain consciousness after a while when he speaks. As he shares the highlights of the five days he spent on Machu Picchu during his initiation, we each slip into altered states. The initiate first shows us the energetic grid upon which the city is constructed pointing out rocks and lines which to the eye appear to be happenstance until they pulse to life before our eyes. It’s like being propelled into a narrated dream. It’s not long before I can’t keep my eyes open, none of us can, his words narrate the movie showing inside and out. Everything is very alive. He shares with us his initiation and describes what he was shown. 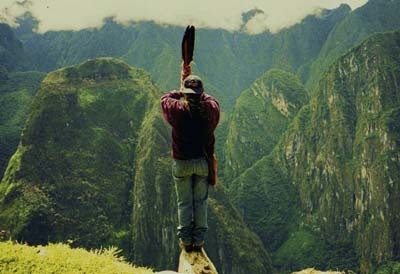 In doing so we are drawn into his initiation and we’re seeing Machu Picchu through his eyes and words. He continues to describe his awakening on the mountain. After the instruction in the deeper mysteries of the geometry and the city itself, he was then directed to proceed down and into the caves. For days he wandered in the tunnels below the city. At one point he tells us the tunnel divided; one side glowed orange, one side glowed violet. A choice had to be made. He chooses the violet path. He tells us that only later was he told that had he chosen the orange path first he would have died. Next time it will be the orange path he must travel. His story propels us with him on the journey. Our fleshy mobile units sit passively on a ledge above the city. To a passer by, it appears we are asleep. On the inside we are being blasting through dimensions by the young man's unassuming words and the consciousness in which he saturates them. One group member struggles to regain reality as she knows it, by asking a question. The initiate answers, the energy shifts slightly but is quickly restored. I hope he is aware that it is not disrespect. We are each to our own ability, tracking him as best we can but the energy he presents is stretching us far beyond our norm. Finally we can track him no further. He brings us back to ourselves and Machu Picchu. He walks us back towards the bus. Clouds are gathering as we walk down the slope passed the Temple of the Sun. There in the courtyard, Cucho's teacher appears. The awesome old man approaches us from the far side with intent. He looks straight at Cucho, speaking what I assume is Quechua The words are for all of us, but his eyes fixate intently on the initiate. Intuitively, I’d say, he was telling us that this young man is a great being, that he has a destiny greater than he can fathom. We stand facing the priest and the Temple of the Sun in half circle, Cucho sandwiched between us. The teacher's last word is punctuated, just in case we might have missed it, by a deafening, blinding strike of lightning, directly behind the old priest. The tourists are gone. This show is for our eyes only. The look of wonder and awe in the initiate's eyes is almost as cool as the priest with the lightning. We can't say precisely what we were just privileged to witness, but it was without a doubt a privilege. The old man nods his good-bye, the show is over, a few fat rain drops have begun to fall. As I walk pass the teacher, I hold out my hands which he takes firmly with a grin and a nod. I bow my respect briefly. He squeezes my hands warmly and quickly releases them as is starts to pour. We run through the downpour, I turn back to wave my thanks but the old man has disappeared into the clouds.